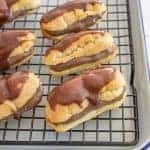 Chocolate Eclairs made with a traditional eclair pastry, stuffed with homemade chocolate custard, and topped with a rich chocolate icing. In a medium to large sauce pan, heat the water and butter to boiling. Remove from the heat and the flour all at once, stir constantly until mixture is smooth and forms a ball. Beat in the eggs, 1 at a time, fully incorporating before adding the next. When the eggs are all mixed in, mix well until the mixture is no longer shiny (about 1 minute). Place the dough into a pastry bag. On a greased cookie sheet, pipe out dough in thick lines that form eclairs. Bake for approximately 30 minutes or until light brown. While the pastries cook, make the filling. In a medium saucepan, prepare filling by whisking together the flour, cocoa powder, sugar and salt. Whisk in about 1 cup milk and cook over low heat, stirring often, until thickened, about 2 minutes. Slowly add a ladle-full of the hot milk mixture to the bowl of eggs and stir to combine and then add the egg mixture back to the sauce pan on the heat, whisking as you pour it in. Continue to cook and add the vanilla. Set in the fridge to cool. With a serrated knife, slice pastry puffs lengthwise, but not all the way through. Pipe or spoon the custard mixture into the center. To make the icing, add the chocolate, cream, and sugar to a medium sauce pan. Cook over medium heat, stirring often. Bring to a simmer. Simmer for 5 minutes. Let cool and beat until smooth. Ice tops of the eclairs. Cool or serve right away. Store leftovers separately covered in the fridge. I like the icing but they are good without it, too. It’s optional though it does add lots of chocolate taste.